Top scoring with a 70 on first class debut against Nottinghamshire was impressive enough for Lancashire youngster Liam Livingstone. But on day two at Taunton, the 22-year-old went one better by posting his maiden first class century in just his County Championship second innings to ensure his side remain in control against Somerset. On a rain-affected second day, Lancashire’s charge was delayed by a complete washout of the afternoon session. Having lost skipper Steven Croft just short of his own century before lunch, pressure for marshaling the innings after the resumption fell to young Livingstone. He did it magnificently and, with the help of some impressive lower-order batting, Lancashire posted a commanding first innings total of 493-9 when the declaration came, leaving Somerset facing a testing six overs at the end of the day. The opening pair of Marcus Trescothick and Tom Abell negotiated that spell and will return in the morning to chase down Lancashire’s huge total. Lancashire resumed day two in control of the match at 295-4 after a century stand between Alviro Petersen and skipper Croft on day one. 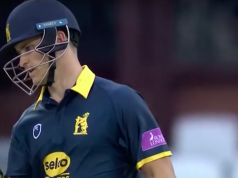 But they got off to a nightmare start as Alex Davies perished in the first over of the morning without adding to the score as he was caught behind off Tim Groenewald for 32. Croft was still going along nicely and, alongside Livingstone, began to push the score along as both dispatched left-arm spinner Jack Leach for sixes in quick succession. The pair put on a 50-run partnership and Croft looked set for a fine century. But he fell short of the milestone as he nicked Roelof van der Merwe through to the keeper and was forced to depart for 94. Iffy light before the interval caused a brief break in play before an early lunch was taken with Lancashire well placed on 372-6. But heavy rain during and after the lunch interval meant that no play was possible at Taunton in the afternoon session and when an early tea was taken, the sunshine emerged allowing play to resume at 4.15pm with 38.4 overs remaining in the day. Shortly after the resumption, Neil Wagner was Van der Merwe’s second victim, bring James Anderson to the crease at the dizzy heights of number nine. Craig Overton had the England seamer caught by Trescothick at second slip for just eight and Lancashire were 399-8. Kyle Jarvis proved he was no rabbit at number ten, as he and Livingstone put on a 50 partnership for the ninth wicket and pushed the team total past 450 as they continued to make Somerset’s bowlers toil. But the day belonged to Livingstone. He showed no signs of nerves, powering through the 90’s with a six off Jack Leach before bringing up a fluent and classy century off 139 balls, featuring nine fours and two big sixes. His tenth-wicket partnership with Jarvis extended to 80 before the Zimbabwean international became the third man to fall to Van Der Merwe’s left-arm spin for a well-made and highly valuable 34. The Lancashire declaration came on 493-9, with Livingstone unbeaten on 108, giving him a current first class average of 178. Lancashire would have loved one or two wickets before the close and the new ball pair of James Anderson and Jarvis opened up in pursuit of an early scalp. But Trescothick and Abell saw off the six overs without any real scares to close on 14-0. On a shortened day, it was Lancashire who again dominated proceedings and will be delighted with the efforts of their batting unit who made the most of a flat track at Taunton to put the Red Rose on top after day two.